These nutritious pancakes made with heart-healthy California Avocados are the perfect morning meal for babies, toddlers, and even teens. 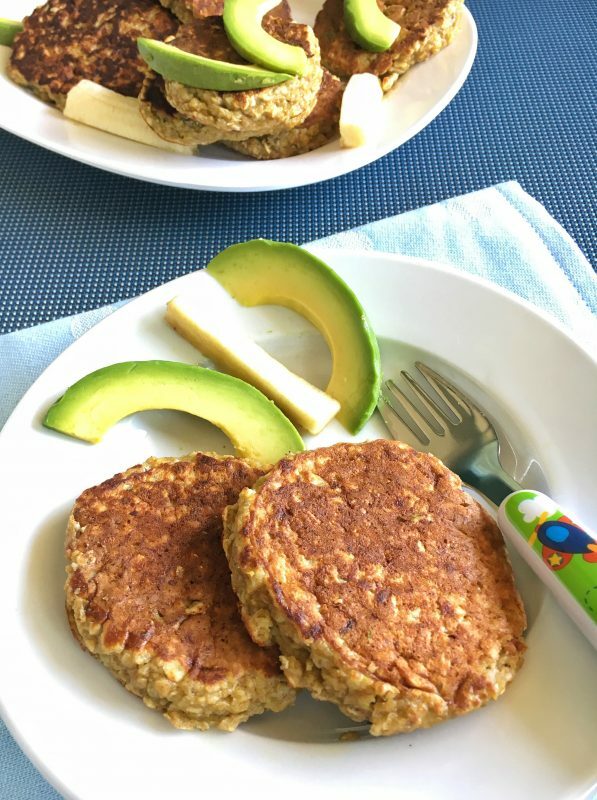 They come together quickly with wholesome California Avocado, banana, eggs, ricotta cheese, milk, cinnamon, and whole grain oats. Many thanks to the California Avocado Commission for sponsoring this post. Did you know that smooth, creamy avocados are a great first food for babies? They’re soft, neutrally flavored, contain good fats and contribute nearly 20 vitamins and nutrients to the diet including a good source of fiber (11% DV), folate (10% DV) and vitamin K (10% DV) along with potassium (6% DV). And did you know avocados can be used as an ingredient in pancakes? 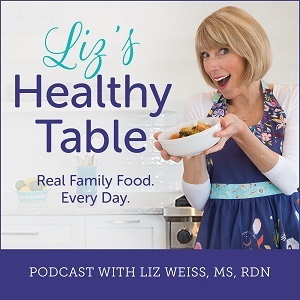 On this week’s Liz’s Healthy Table podcast, I chat with Katie Ferraro, RD, from Fourtified Family. Katie is an expert on Baby Led Weaning (AKA Baby Led Feeding). She has one-year old quadruplets and a toddler, so she knows a thing or two about feeding babies. And she’s a big fan of avocados, which are sodium and sugar free and easy for tiny fingers to pick up when sliced. 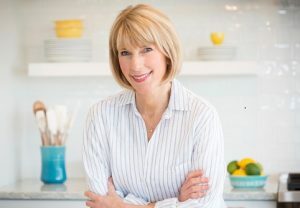 Click the PLAY button above to hear my interview with Katie as she explains the fundamentals of Baby Led Weaning, first foods for babies and ways to incorporate avocados into baby and toddler diets. 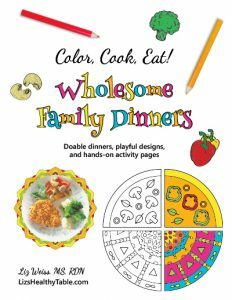 Before starting or introducing new foods, parents and caregivers should consult a physician or health care provider. 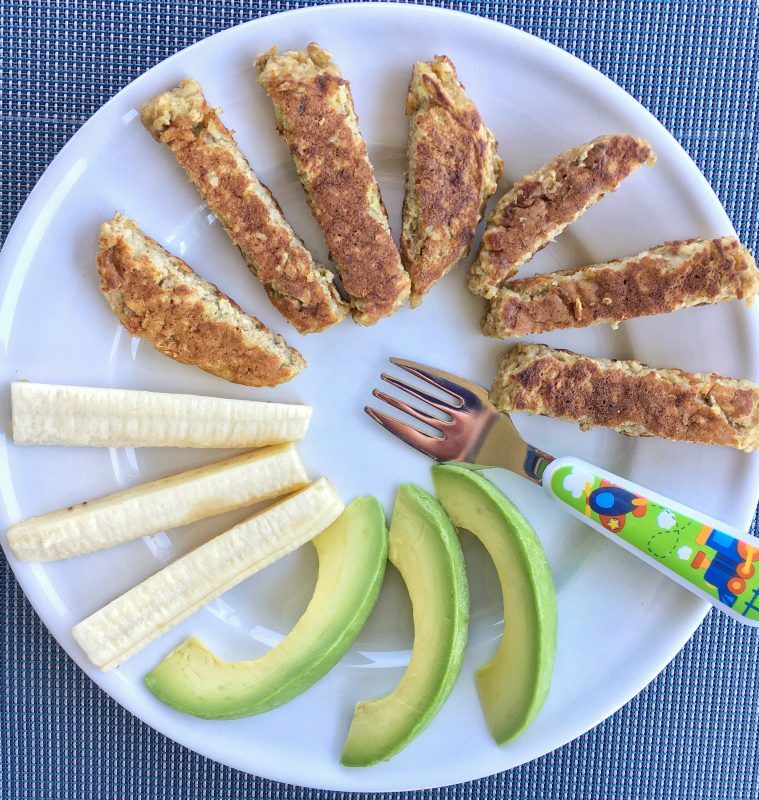 Once your baby is ready to transition to solids (listen to the podcast for details on when a baby is “ready”) Katie recommends cutting soft foods into slices big enough for babies to grab and grip. 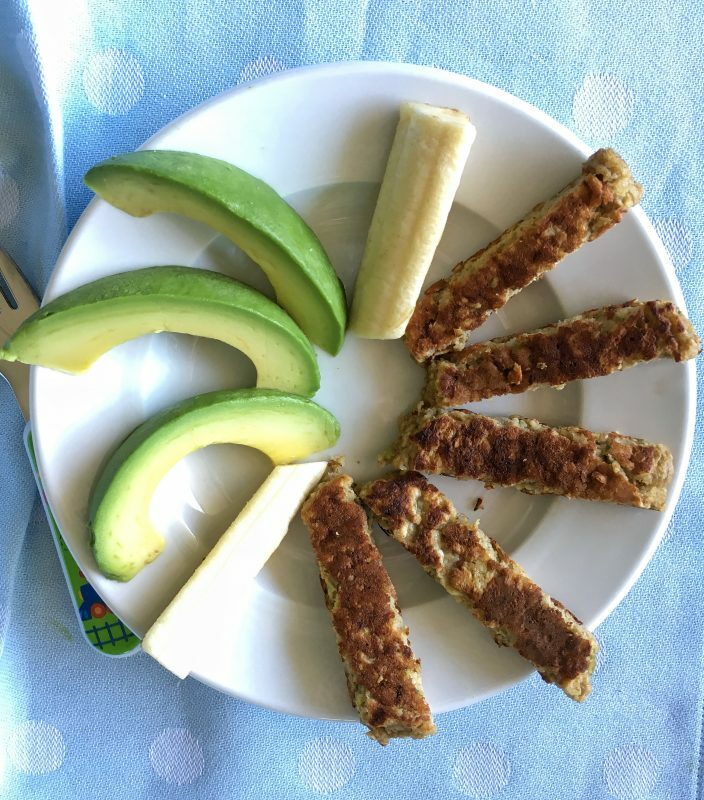 For my Fluffy Ricotta and California Avocado Pancakes, simply slice each pancake into “sticks” and serve with banana and avocado slices. 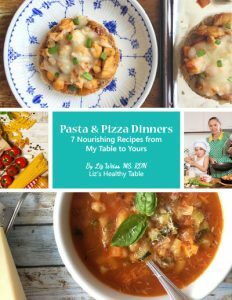 When I created this recipe, I intended it to be for babies and toddlers. But when you have a hungry 18-year old in your midst, don’t be surprised if the pancakes disappear as quickly as you can make them! And speaking of portions, it’s interesting to note that a third of a medium avocado (50 g) is considered a serving. 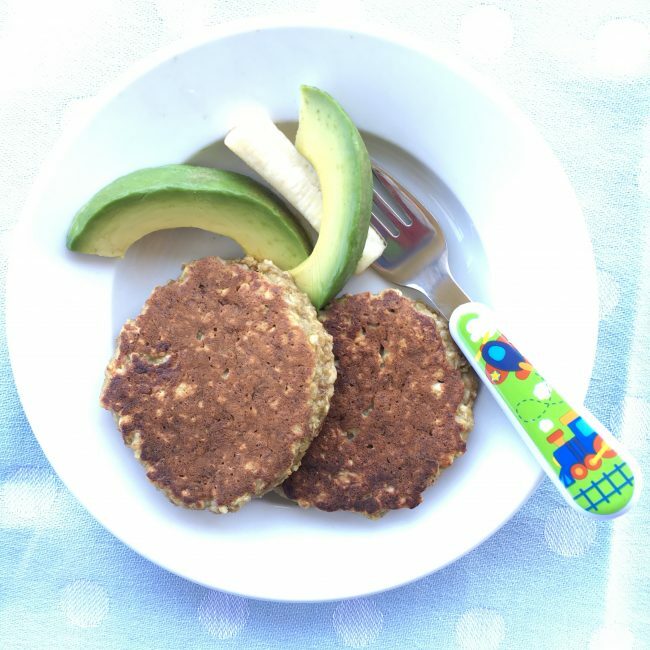 For one to three year olds, a serving is a sixth of a medium avocado (25 g). Click here for more nutrition information on California Avocados for moms and kids. For general nutrition info, visit CaliforniaAvocado.com/nutrients. 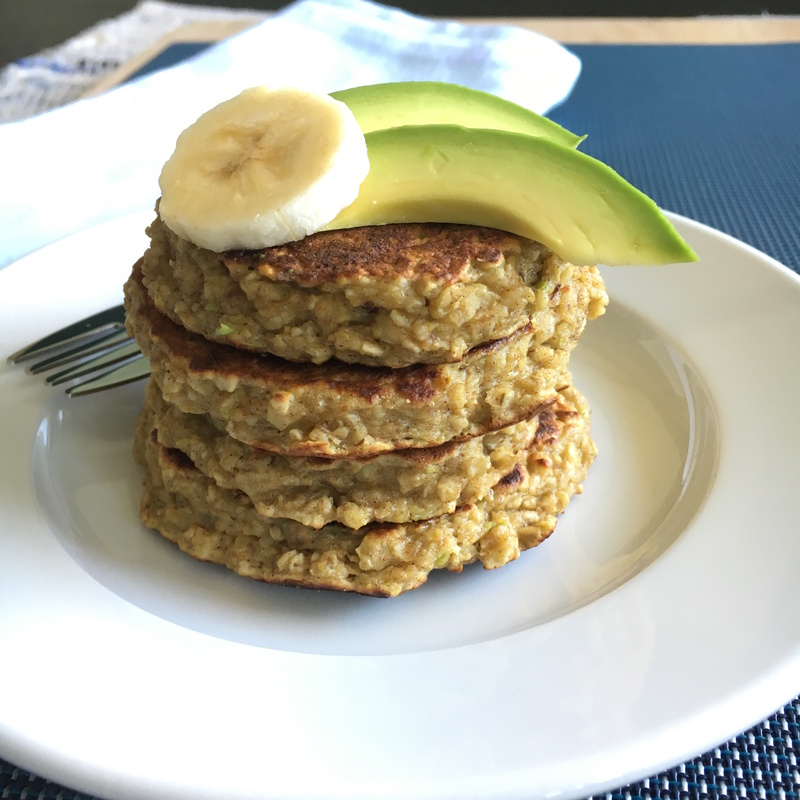 Avocados add a natural lusciousness and creaminess to these pancakes and the bananas add natural sweetness. Together with the oats, they bring 3 grams of fiber to every serving. There is so much goodness in this recipe besides the fiber including calcium, folate and iron. If you have babies at your table, they'll probably eat one or two pancakes. If you have teenagers at your table like I do, they will probably eat half the batch. Do you go gaga when you slice open a gorgeous ripe avocado? I do. What’s your favorite way to add avocados to your family’s table? Thanks Diane. Glad you stopped by to take a look around! These look excellent. Do they freeze and reheat alright? Been making these since we started BLW when our little one was 6 months old. Little one tolerated really well and enjoyed. Now 12 months and still enjoys. These ricotta pancakes are tasty and smell good too (cinnamon). We freeze extras. Thaw in fridge and warm up by putting in toaster (pancakes are sometimes a little crumbly so be careful when putting in and taking out of toaster). We’ve also used 1/2 cup thawed frozen avocado pieces instead of fresh and the recipe still turns out really well.